The effects of the partial federal government shutdown are wide reaching. The shutdown, which is now in its 18th day, impacts federal agencies responsible for providing critical assistance to millions of North Carolinas. In particular, the nation’s food assistance program, the Supplemental Nutrition Assistance Program (SNAP, formally known as food stamps) is at risk both in the near and longer term should the shutdown continue. The shutdown highlights the critical role that federal food assistance plays not just in people’s households but in communities at large. Across the nation, more than 2,500 grocery stores and retailers are unable to accept SNAP benefits as a result of the shutdown due to their inability to renew their permits to accept food assistance benefits during the shutdown. Retailers in North Carolina are disproportionately impacted. According to the USDA, 158 retailers and grocers in the state are no longer able to accept food assistance from families in need. These retailers are providing food access to families across the state, and many are in areas that lack many options for families to secure food for their table. This disruption in retailer’s abilities to accept SNAP has far-reaching consequences. Nearly two-thirds of households that receive SNAP are families with children, and almost a third are families with members who are elderly or have disabilities. And while more than 42 percent of SNAP families are employed, many of those still rely on food assistance to make up for low wages and unpredictable work schedules. 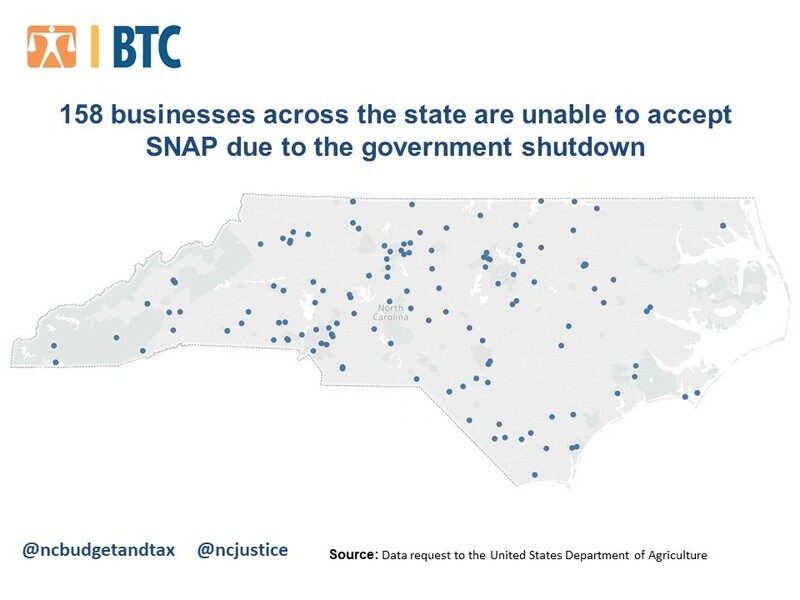 A disruption in the ability of families to access foods, no matter how short or small, means that the North Carolinians who need help the most are the ones bearing the burden of this government shutdown. Families in need are not the only ones affected. Last year, SNAP was responsible for bringing in $2.14 billion into the North Carolina economy through local retailers and grocery stores. These businesses, especially in rural and low-income communities, are vital employers. This government shutdown impacts their bottom lines, making it harder for them to employ their workers. The ripple effects of the shutdown will continue to affect our communities across North Carolina. The multiple harms caused by this shutdown highlight the critical role that the federal government plays in the everyday lives of every American. So, when I receive my benefits for February. Will I be able to use them? Yes, when you receive your benefits for February, you will be able to use them. But those will be your only benefits until March. Maggie, you can see the locations affected at http://www.ncjustice.org/hunger on our interactive map.